Texas law allows for the formation of a “Series LLC.” It is similar to a parent corporation that owns one or more subsidiary, corporations. The Master LLC is formed with the filing of a Certificate of Formation in the Texas Secretary of State’s office and paying a $308 filing fee. 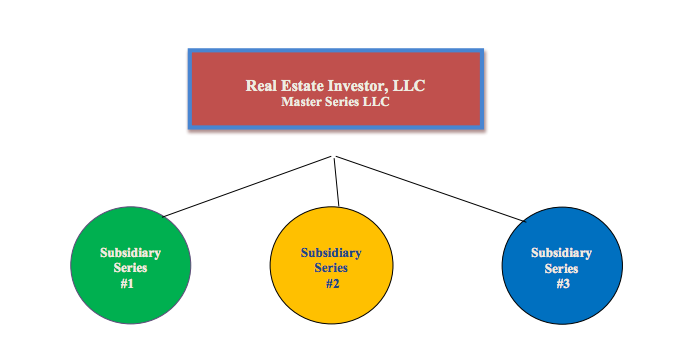 The Master LLC can then create a subsidiary series LLC by performing two simple steps: (1) preparing a supplemental addendum to the company Operating Agreement and formally naming the subsidiary series, and (2) filing an Assumed Name Certificate with the Texas Secretary of State identifying the subsidiary series LLC as owned by the Master LLC. The assets of each subsidiary Series are protected from the losses and liabilities of the other subsidiaries. For investors owning more than one investment property, a Series LLC will offer significant savings over the use of individual LLCs for each property because the investor will not pay the $308 filing fee each time a series LLC is created. The only fee incurred in creating the subsidiary is $25 for filing the Assumed Name Certificate. The asset held by each subsidiary is protected from thirdparty claimants against every other subsidiary. This means a slip-and-fall victim injured on property owned by one series (let’s say, “Subsidiary A”) cannot make a claim against any other series (i.e., “Subsidiary B”) for injuries sustained on the premises of Subsidiary A. Keep the assets and financial records of each subsidiary separate and distinct from every other subsidiary. This means maintaining separate books of account for each subsidiary. While a single bank account may be maintained by the Master LLC, an accounting system must be employed that accurately tracks the income and expenses of each subsidiary series; i.e., setting up separate “companies” in your QuickBooks (or other accounting) program. Each investment property should be owned only by one subsidiary; there should no co-ownership of a property by two subsidiaries. File the proper Assumed Name Certificate with the Texas Secretary of State that indicates its ownership relationship to the Mater LLC. All contracts, deeds, notes, etc., should be signed in the name of the subsidiary series, not the Master Series. Franchise Tax. The Texas Comptroller of Public Accounts requires that the Master LLC file only one franchise tax report under a single taxpayer identification number. This means that the income of all subsidiaries must be combined under a single franchise tax report filed by the Master LLC. The IRS treats the Master LLC and its subsidiary series as separate entities. This will not change the way a normal LLC reports its income, expenses and allocations for federal tax purposes. The bottom–line is that net income will flow through to the owner(s) of the Master LLC. The entire Series (the Master LLC and each subsidiary series) will be governed by the terms of the Operating Agreement of the Master LLC, but may be modified in pursuant to any distribution or internal management rules that may be adopted each time a subsidiary series is created.